“1001 A.D.” by Wes Wetzel is a general interest historical novel with two different stories. One is about a group of Vikings who left Iceland to settle in Greenland, and later the Canadian coast, thus being the first Europeans to sail to and settle in North America. The other is of an American archaeologist who was part of the United Nations team that discovered these Vikings, both in Greenland and Canada. The novel bounces from one story to the next, which, to an extent, helps the stories unfold and build some suspense, but sometimes disturbs the flow of events and needlessly diverts the reader’s focus. The Viking story is fascinating. A small group of Vikings flees an oppressive chieftain in Iceland, and discovers a geyser-warmed and ice-free inlet in Greenland. They create a vibrant community there, with a church, school, community heating system, and more. They hunt and fish, raise animals, teach children, and raise families. They fight a pox, and at times, hunger. The community and the people within it are described in rich detail and one genuinely gets the feel of life among the Vikings a millennium ago. Equally strong is the book’s story of the Viking expedition to North America. The Vikings met and interacted with the indigenous people, and traded whale oil for native corn. They also, unfortunately, gave the natives a deadly pox for which the Vikings were chased away. The Vikings did not much like Canada anyway, since there were far too many stinging flies. The discovery story is far less fascinating and needlessly detailed. The story is principally told as an oral presentation by an archaeologist to an auditorium filled with archaeology students. It is difficult to imagine a setting less ripe for suspense or drama. The author tries, though, setting out in detail the scientists and technical crew in a United Nations Arctic research expedition involved in the discovery, and the sequence of events. The detail is sometimes overdone. This requires a six-page list of characters in the beginning, most of whom are unnecessary for the story. For example, a U.S. Navy officer assigned to mission is described as a “cutie” whose cuteness was a distraction to male naval officers in her prior assignments. However, she is never mentioned again in the book, and her “cuteness” is never an issue. The biggest problem with the “discovery” story for me is that it creates far too much back-story and delays involvement in the real story. The first discovery, a helicopter sighting of an ancient village in Greenland, appears on page 21. The Viking story comes to us via a personal journal, written by one Viking using an animal skin as a scroll, but the journal is not revealed in the first ⅓rd of the book. Once the scroll is revealed, the reader must plow through many pages of it before its momentous implications are absorbed. This includes the fact that a group of the Vikings explored the Canadian coast and St. Lawrence River, interacted with the native population, and established a settlement on the North American continent. The delays in making the “reveals” may have been intended to create suspense, but there were insufficient hints of what was to come earlier in the novel. 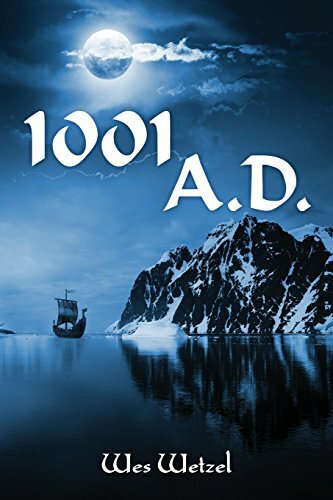 "1000 A.D." by Wes Wetzel is a must read for anyone curious as to how and why the Vikings made it to North America many centuries before Christopher Columbus. Indeed, were it not for the pox and the stinging flies, the Vikings might have established many, more permanent, settlements on the continent. Despite its flaws, the book takes us pleasantly along through this fascinating journey.